The best way to become Super Lean is to starve not your whole body (as in dieting) but to starve only your fat stores, while at the same time nourishing your muscles. part of who you are: a habit, and a way of being. 1. Following my Super Lean Regime and Super Lean Training Plan. 2. Eating more foods that promote muscle development. 3. Cutting back on foods that promote fat storage. 4. Timing your meals to promote muscle development and prevent fat storage. 5. Exercising to burn body fat. 6. Exercising to develop muscle tone. Only a combination of healthy eating and exercise (cardio and strength training), which is the essence of my Super Lean Routine, can truly optimise your body composition and let the Super Lean Athlete inside of you out to play. 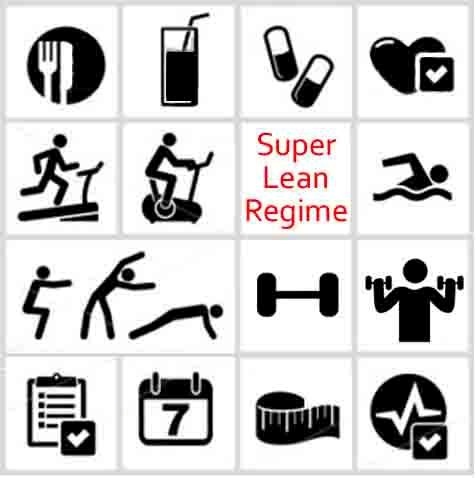 Are you ready for the challenge of my Super Lean Regime?